In June we have a special guest teacher at Lively Yoga all the way from Thailand. 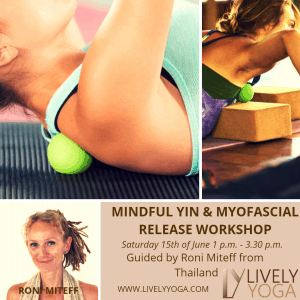 If you want to deepen more into the practice of self-healing with yoga therapy balls, Roni will guide you through this 2,5 hours workshop. She will also bring her Singing Bowls, Gong and a Hapi to make this experience complete. 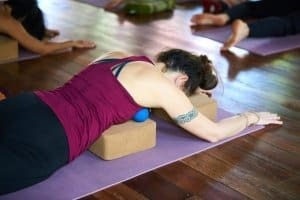 Back pain, shoulder pain, tight hamstrings, yoga therapy balls are a self-massage using balls to release tension and tightness into the deeper tissues of the body. Releasing tension into the stressed tissues, creates more mobility and movement in the body, which means less pain. Experience a highly effective profound technique which facilitates the release of muscle fibres (myo) and connective tissue (fascia), to ease restrictions of movement, tension and pain brought about by excessive sitting, postural habits, imbalanced athletics, emotional stress or injury. It is a type of deep self-massage using small balls and blocks holding each position for 3-5 minutes. We explore Myofascial theory, postural alignment, and in combination with Yin Yoga we will uncover ways to release the essential areas of the upper and lower body. Roni teaches from personal experience of using Myofascial Release to gain more mobility and ease in her body during a herniated disc in her lower back. The approach is body-mind centred as an embodiment tool incorporating Mindfulness and grounding practices, leading to increased self-awareness on all levels, physical and emotional release. These are take-home techniques that are simple and easy to apply and a convenient and economical self-treatment option. Enhance structural balance, mobility, energy flow and your asana. Enjoy a deeply soothing live Sound Healing Savasana to integrate the practice. Originally from the UK, Roni is the owner of Pure Nature Yoga, Thailand, where she has been mainly based the last ten years. Certified in Myofascial Release as well as a Certified Yoga Therapist with IAYT (International Association of Yoga Therapists), she specialises in structural therapeutics, and also women’s health and emotional balance. A Certified Sound Therapist and Tibetan Buddhist practitioner, taking refuge in the Karma Kagyu Lineage in 2004, Roni interweaves Mindfulness and sound into her teachings for internal resonance. Roni is passionate about sharing embodiment tools for deeper connection and understanding of the body-mind complex. She brings a deep knowledge, presence, and grace to the practice exploring the nature of the mind, therapeutic elements, and biomechanical principles. Roni invites students to approach their body from a place of curiosity and acceptance through cultivating awareness and being truly present, developing wisdom and compassion. Time: 1 p.m – 3.30 p.m. Please bring 2 towels for this workshop.